Scarecrow entries must be registered October 1, 2018. There is a limited number of spaces. Sunday, October 14th 2 pm to 5 pm. While every reasonable precaution will be taken for safeguarding exhibits, it should be understood the exhibits are entered in competition for prizes and that the owner assumes all responsibility for any accident, loss or damage that may occur. Neither the Fair Management its officers nor agents will be responsible for any such accident loss or damage. All exhibits enter in competition shall be subject to the control of the Director of the Scarecrow Contest. Exhibits which display or distribute material of a controversial or political nature will not be permitted. All applications for exhibit space must have the unanimous approval of the Fair Committee. The Fair Committee reserves the right to decline exhibit(s) if deemed advisable. All exhibits MUST be in place and fully installed by 5 pm Sunday or otherwise they will not receive consideration from awarding committee. No exhibit shall be removed in whole or part during the period of the Fair. All scarecrows and articles, after being entered and until surrendered to the owner or agent will be entirely under the control and jurisdiction of the Fair Management. No exhibitor will be allowed to remove, handle, rearrange, improve or disfigure under same circumstances, unless permission is granted by Department Director or Fair Management. If any exhibitor rudely refuses to comply with competition regulations or final judgements, he/she will be disqualified from receiving premiums and barred from future entries until proper amends have been made. The reinstatement of the offending party will depend on a majority vote of the Fair Committee. An exhibitor who tears off a premium ribbon or authorizes any person to do so in the presence of the awarding judge, or refuses to accept a ribbon from a judge, or insults the judge shall forfeit the premium or diploma and be excluded from competition. Any exhibitor having a space reserved and not occupied 24 hours prior to opening of the Fair may have reservation cancelled at the discretion of the Management. Exhibitors will be held responsible for the cleanliness of their exhibits and space surrounding same. No work of this character will be permitted during the hours the Fair is open to the public. No smoking or lighted candles, lamps, matches, etc., will be allowed in or near Scarecrows. When space is allotted, a permit to occupy space will be given. Such permit is not transferable. No other party will be allowed to share space with the original applicant, except upon the approval of the Management. Advertising by means of posters, prints, hand-bills, samples, etc., will not be permitted on the Fairgrounds, including the Parking Lot, except upon agreement with the Fair management. 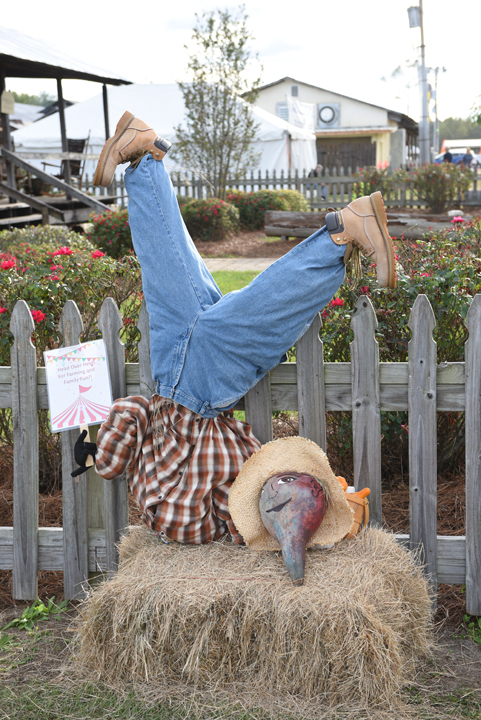 The Scarecrow Contest is open to active Junior and Senior 4-H and FFA Teams (Grades 7-12, from Bryan, Bulloch, Evans, Candler, Tattnall, Jenkins & Screven Counties). No more than 5 members per team. This year’s Fair theme will be announced. Displays should reflect the theme but is not a requirement. Only one Junior and Senior entry per school/chapter. Entries should be free standing. A 2” x 2” T form 5’ tall will be required as support of the scarecrow(s). The form is to be used as the skeleton of the scarecrow. Points will be deducted for pre-made forms attached to the frame. Appropriate PVC pipe can be used for frames. Design and basic building may be done before arriving at the fairgrounds. Area for display will be roughly 3’ x 3’. Teams will draw a number upon check-in. This number will coordinate with display spot. Old clothes may be used but purchased costumes are prohibited. Scarecrows should be lovable not frightening. Use of copyrighted or trademarked characters or logos are not allowed. This includes but not limited to TV, Movie, Video, etc. characters. The used of the 4-H and FFA emblems are allowed. Originality is highly encouraged. No electricity will be available. Use of battery powered drills and screwdrivers is permitted. Items that can be used as weapons will not be allowed on display. Dried non-perishable agricultural products may be used (corn stalks, peanuts, gourds, cotton, potted plants/flowers for example). Fall harvest produce such as pumpkins or winter squash may be used but if they show signs of decay during the Fair they will be removed. No real carved pumpkins will be allowed. Funkins may be used for heads. No artificial produce or flowers may be used. Scarecrows will not be removed until Sunday, October 21st between 2 pm and 5 pm. Area must be cleaned before leaving or prize money will be forfeited. Any Scarecrow left on the grounds after 5 pm will be discarded and prize money forfeited. Prize money will be mailed to advisor.